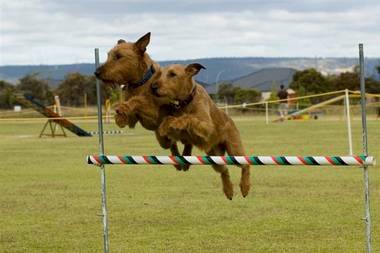 This page is dedicated to the Irish Terriers doing so well in the obedience, agility and jumping field. They are Nuala (Coolaney Nuala) and Finn (Anluan In Like Flynn) owned by Tom and Pamela Connor. Coolaney Nuala gained her Jumping Title on Sunday 30 July 2006 and gained her Endurance Title on her first attempt. She has now added Gambler Dog to her string of titles. Congratulations to Pam and Tom Connor. We at Coolaney Kennels are very proud of you all. 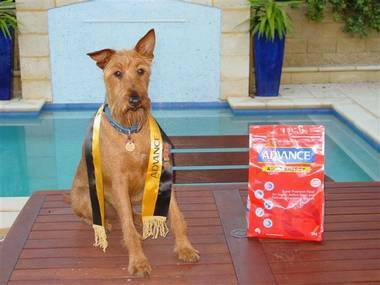 When Nuala obtained her Endurance Title the following are the words of her owner "Yesterday Nuala completed a 20km endurance trial and passed with flying colours. The trial was held by the German Shepherd Club and she was the littlest dog by a country mile but she was the fittest. After 20km her heart rate was only 90 and the vet commented that she looked as though she hadn't done anything! All our training over the past 12 months really showed. The handler was a different matter and I have spent the last 24 hours recovering from what was a pretty gruelling ride over rough ground not to mention the 3 falls that I took from the bike!! I'm wearing my bruises with pride. We are all very proud of Nuala who can't understand what all the fuss is about. As well as having to deal with my frequent tumbles from the bike, Nuala also coped with the sight of 4 big kangaroos hopping down the track just in front of us and having to complete the course at an average speed of just over 12 km/hour due to a mix up by the tmekeeper who kept telling all the competitors that they were going too slow! Even at 12km/hour the German Shepherds were just trotting but Nuala had to canter the whole way - what a star." 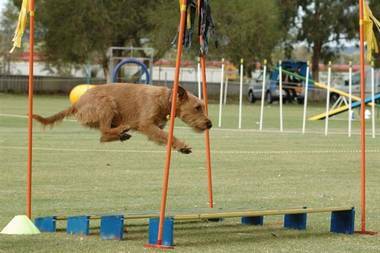 She is the first Irish Terrier to gain her Endurance Title in Australia and maybe the world. Congratulations to Pamela, Tom and Nuala for a job well done. 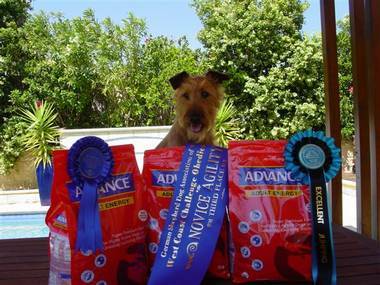 Nuala shown with her Third Place win at the recent State Novice Jumping Trials in Western Australia. This was at her first attempt ever - how clever is that!!! Finn also showing off one of his recent wins. Nuala displaying her talents at a recent novice jumping day. Go girl!!! 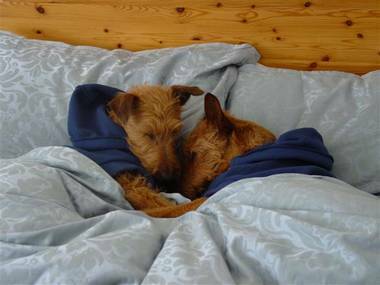 Finn and Nuala after a hard day jumping - you have to get your rest you know!! 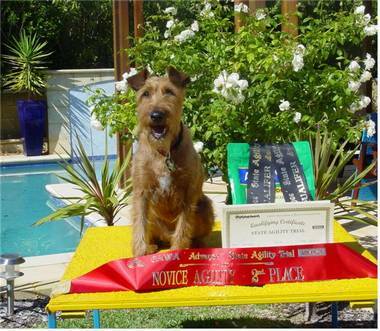 The latest report on Coolaney Nuala and her achievements - words from her owners Pamela and Tom Connor - This is a photo of Nuala with her prizes from only the last 2 weeks of trialling. What a superstar! On Sunday, she jumped the round of her life to come 3rd in Excellent Jumping and gain her JDX title which moves her up to Masters where she will be competing against Murphy. She completed the course which had a time limit of 29 seconds in only 21 seconds and was only beaten into 3rd place by 2 very fast border collies. How good is this from a 2 year old dog that only competed in her first proper trial 6 months ago!! The other ribbons are for a 2nd in a Jumping and a 3rd place in Agility. She also gained a pass in Novice Snooker last week (one of the new games introduced this year). 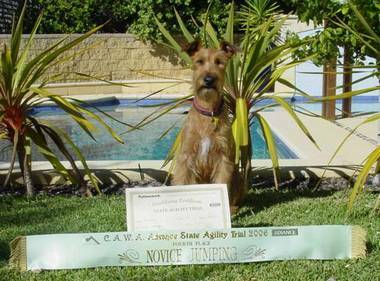 Below is a photo of the latest achievement for Coolaney Nuala - She attended the CAWA State Agility Trials on 20/21 April 2007 and was placed 2nd in Novice Agility. Congratulations again to Pamela and Tom Connor who work so hard with their dogs.